Let’s talk about board formed concrete. Have you heard of it? Have you seen it? If you haven’t in my opinion you should. In the right application it is beautiful! So what exactly is it? Board formed concrete is the name for a process of patterning concrete using wood forms which leave a wood grain image on the finished face of the concrete. What is revealed when the boards are removed is as varied as the types of boards used – knotty and rough, or smooth. Before plastic and metal, wood was the forming material of choice for precast and cast in place vertical concrete. Wood was cheap, readily available and could withstand the significant weight and pressure associated with a concrete pour. Today it is a method that is being used more frequently because concrete is extremely well-suited as a finished material in modern design, and by imprinting the wood grain on the surface, it visually softens and warms concrete’s somewhat cooler appearance allowing it to work seamlessly in many different design aesthetics. We get excited when we get to incorporate this design element. We had an opportunity to use board formed concrete in a home we deigned that has a mix of styles incorporating both modern and traditional elements. In this project we thought board formed concrete would be the perfect fireplace surround. We wanted this surround to be smooth while still showing that beautiful grain effect. We could have varied this look by how the boards were spaced when forming the surround. Boards that are widely spaced create a rough raised effect whereas boards that are tightly spaced create a smoother look. 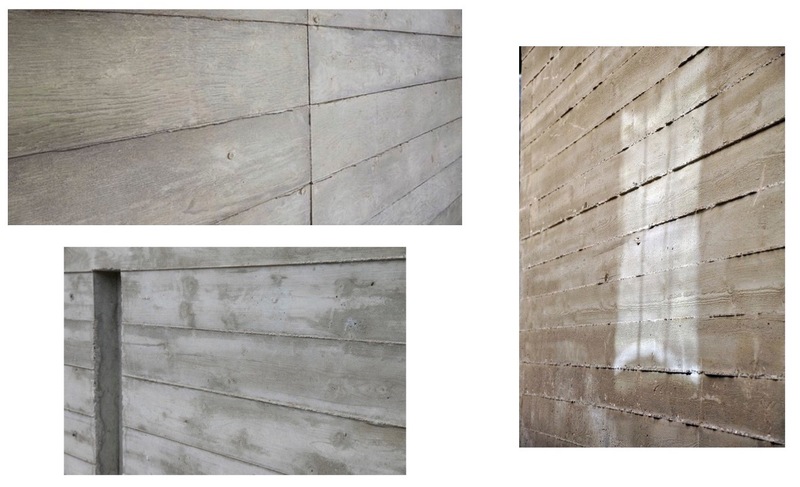 Below are some photos showing examples of smooth versus a rough board formed concrete.